Copper is a productivity CRM platform for businesses. 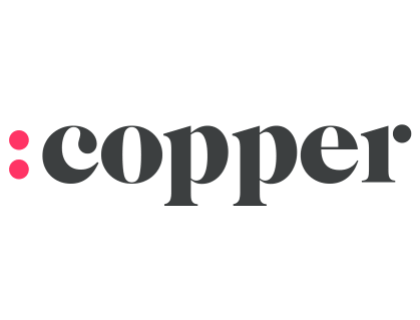 Copper’s solutions include activity tracking, campaign management and lead capturing. Businesses can use Copper to efficiently manage customer relationships, forecasts and proposals. Pros: Great email integration and the filters are easy to use. Cons: Field mapping needs to be done prior to importing lists. Bottomline: Superb CRM solution which syncs perfectly with G-Suite. What is Copper’s price range? Copper's plans range from $19.00 to $119.00 per month. Is there a Copper free trial? Where can I find the Copper login? You can go to www.copper.com and find the “Login” at the top right corner of the homepage. What are some Copper alternatives? Beautifully designed and seamlessly integrated with g-suite. So far so good! Super easy to use and excellent for collaboration between team members. One of the best CRMs that I've ever used. We have been using for 2 years and pretty satisfied about it. I have used a lot of CRM and this one makes it really easy to add contact event if you talked with them once in an email. They get add right from you gmail and they give you ideas if you don’t have someone in your Crm. The one thing that I think they should work on is a better integration with qb online. You have to setup a zap to make that work. But one thing wrong is still a 5 star in my book after seeing so many CRM's. I searched for, and tried, several CRM’s but they were all over blown, for my needs, and cumbersome to use. ProsperWorks plug right in to my Gsuite mail and is easy to use and is not trying to be all things to all people yet it has every function I require. Love the built in tasks and the fact that it creates a calendar in my Gsuite that is accessible even on my mobile devices. Also love that it saves emails from those I have set up. Due to the fact it is quick and easy to use it works! Highly recommend for any small business. Good reports too!